It is at this stage that the piece is imbued with is own individual character. As you will have seen from the gilding section the appearance of the leaf at this stage is unappealing. Depending on the finish required the gilded leaf will either be tarnished or under go a process of antiquing. 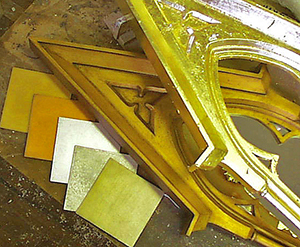 Depending on how aged the surface finish required the antiquing process may involve distressing the leaf, followed by the application of as many as three layers of waxes or paint based pigments. 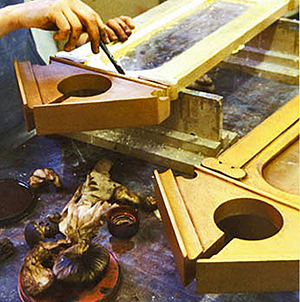 Each treatment has to be sealed with the appropriate lacquer before the next is applied. In this fashion the desired patina is pains-takenly built up. Where a tarnished leaf finish is required the leaf is sprayed with a mix of diluted chemicals and left to dry. To avoid the reaction continuing the surface is sealed with two coats of lacquer.